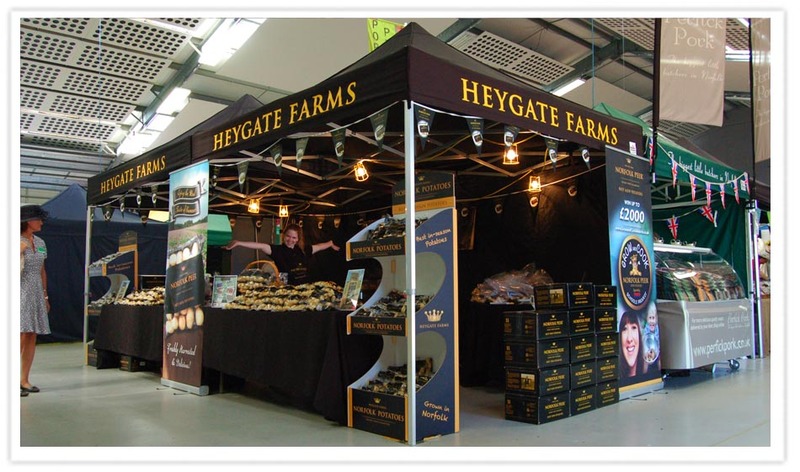 July 1 and 2, 2015 - The Royal Norfolk Show. Here we are again, all set-up at the Royal Norfolk Show. We steamed over 100 kg of freshly harvested Norfolk Peer new potatoes on the stand over the two days and the weather was also a bit steamy, with temperatures in the food hall of over 30°C on the first day! Thank you to everybody who visited our stand over the two days and for all the fantastic feedback on just how good freshly harvested new potatoes are. June 25, 2015 - Moving onto the next Norfolk Peer field. The first field of Norfolk Peer new potatoes will be finished tomorrow, so in preparation to move the harvester to the next field, we are flailing the green tops off the crop. 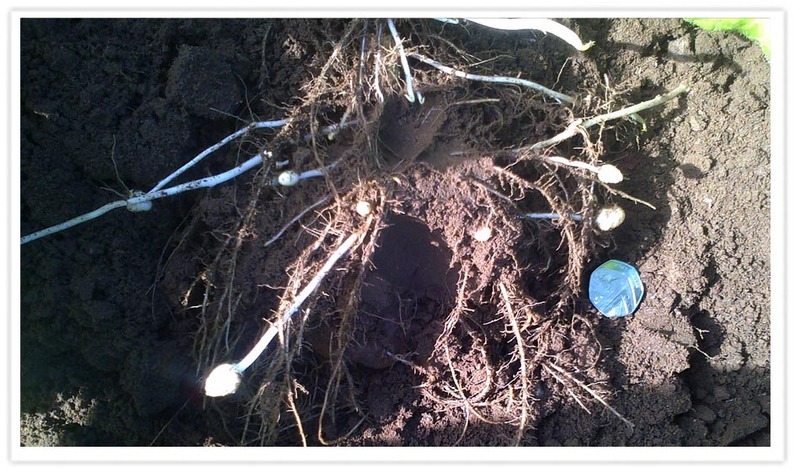 This stops the potatoes growing larger before harvest and adds vital nutrients back into the soil to help future crops grow. Potatoes won't be grown again on this field though, for at least 7 years. This gives the land time to rest and naturally eliminates any soil borne pests. 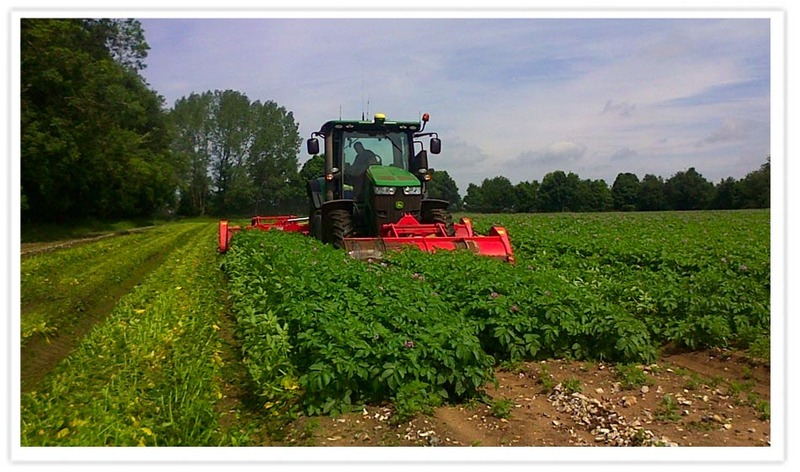 June 10, 2015 - New season Norfolk Peer new potatoes are go! 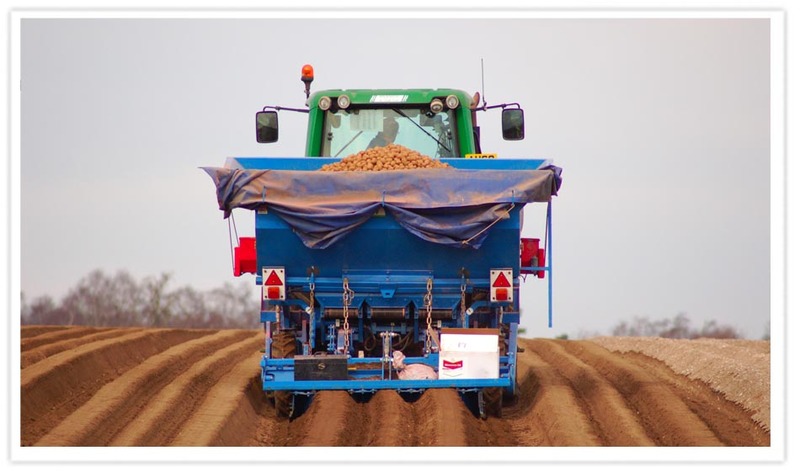 It's 6.30 am and off we go for the start of the 2015 Norfolk Peer new potato season. We love seasonal produce and for us, Norfolk Peer new potatoes are a true Taste of Summer. The fact that they are only available during the summer makes them all the more special. This picture shows the very first Norfolk Peer new potatoes coming out of the washer, ready for packing and off to customers today. June 8, 2015 - Norfolk Peer new potatoes in flower. 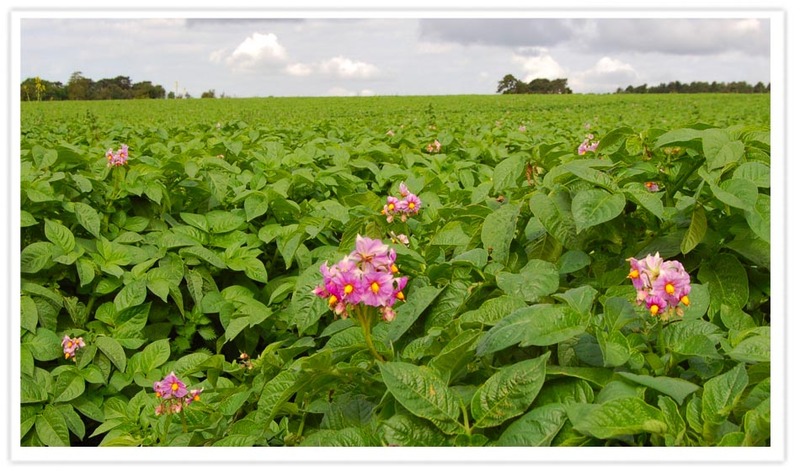 Our first field of Norfolk Peer new potatoes is now coming into flower and this announces that harvest is imminent. 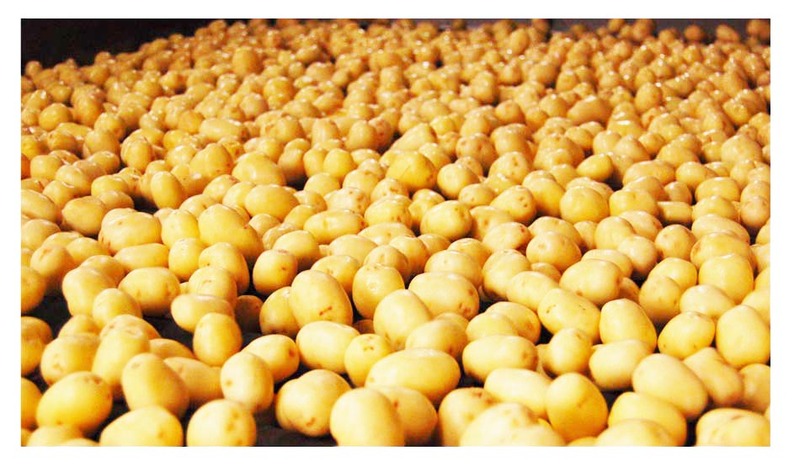 We are planning to start lifting the first new potatoes this Wednesday. May 28, 2015 - Not long now! 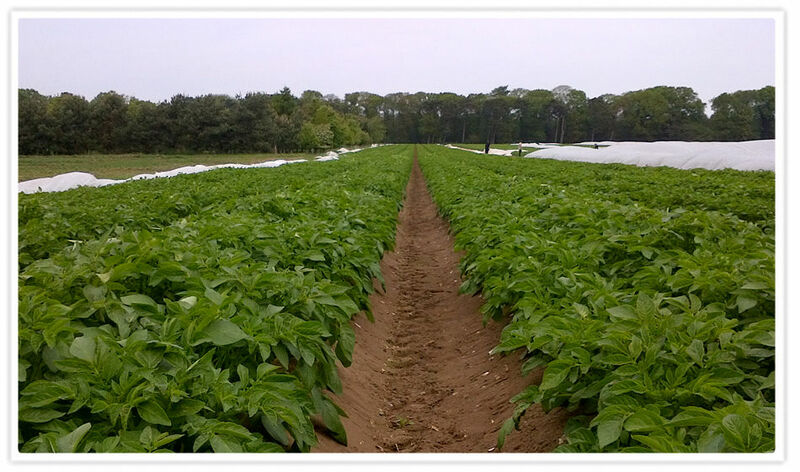 Here's the latest pic's of our Norfolk Peer new potato crop and they are developing very nicely. We would like it to be a bit warmer and are having to keep the crop supplied with regular irrigation, as we haven't had any rain for several days but growth is still strong. We will start test digging next week to give us a better idea of when the harvester will roll out, but not long now. We did dig a handful to cook up and taste (it has been a long time since the last crop of new potatoes) and we can confirm that Norfolk Peer new potatoes are as delicious as ever. May 20, 2015 - Growing nicely. Our Norfolk Peer new potatoes are growing in size very nicely. Could do with some warmer weather though. The last few days have been more like April but the heavy showers have provided plenty of valuable water. May 15, 2015 - Fleece off! A beautiful mild day here on the farm today. 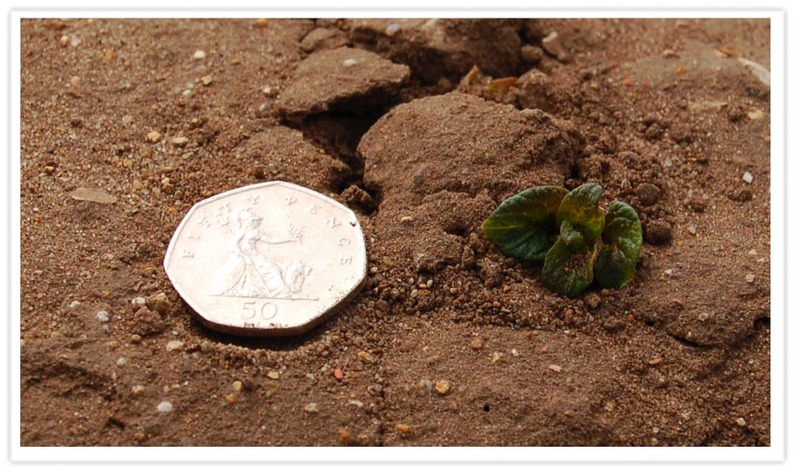 16°C and our Norfolk Peer new potato crop is growing fast in the spring sunshine. We have removed the protective fleece today to give the crop more room to grow. Hopefully we are past the frosts now. May 11, 2015 - The first promise of summer. We have had to contend with the elements over recent weeks. 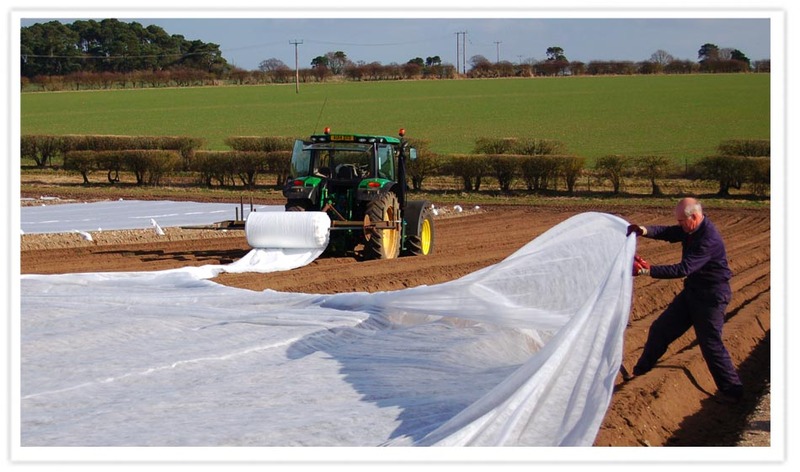 Late frosts have nipped the young Norfolk Peer plants and strong winds have done their best to remove the protective fleece that covers the plants - twice! 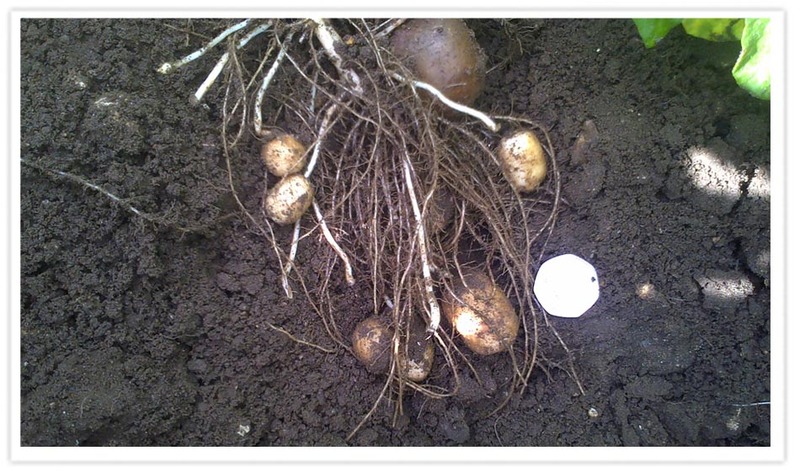 But they can't be stopped and here is an exclusive picture to show the very first sight of Norfolk Peer new potatoes. Like the first Swallow, the arrival of Norfolk Peer new potatoes promises that summer is just around the corner. April 28, 2015 - More water needed. Potatoes are thirsty things and need just the right amount of water to grow properly. With very little rain over recent weeks we are having to help with irrigation, adding the equivalent of 25mm of rainfall today. 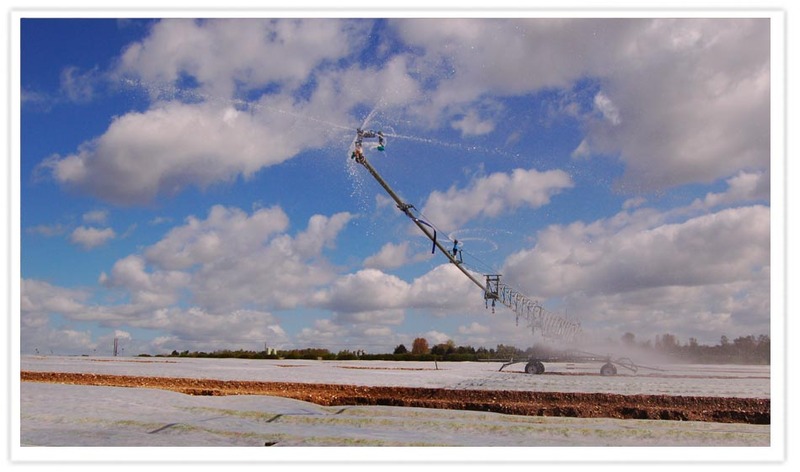 Water is drawn from the chalk aquifers that run under the farm, adding to the unique flavour of Norfolk Peer new potatoes. April 28, 2015 - Norfolk Peer growing fast now. 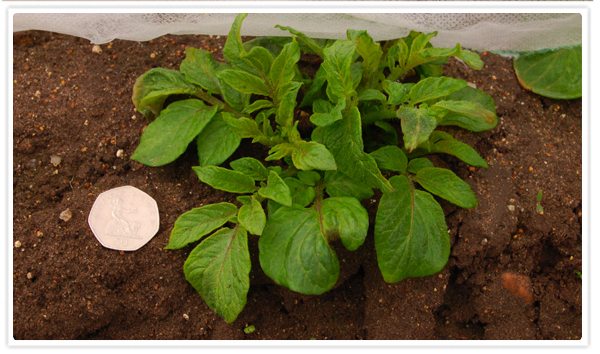 Now that our Norfolk Peer new potatoes are above the ground, they grow very quickly. We had a frost last night but the fleece covering the crop is keeping the worst of the cold off the tender crop. April 23, 2015 - Time to get the hoses out again. Irrigation starts. It's been a cold start to the year. The average temperature over the first 3 months was just 4.6°C, 2°C down on a year ago and it's been very dry as well. So, time to get the irrigators out again. 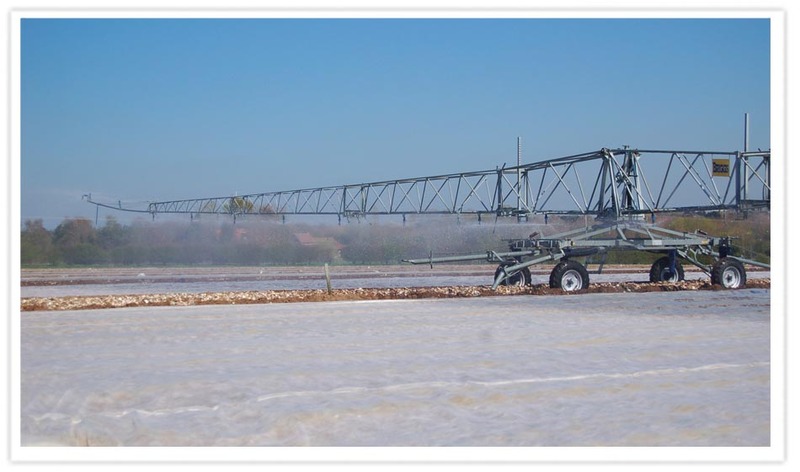 Our 72 metre boom irrigator is very effective at pumping water to exactly where it's needed. We are putting the equivalent of 12.5mm of rain onto the growing crop today, pumping out around 200 gallons of water a minute. April 16, 2015 - Hello Norfolk Peer! So here we go, the first sign of this years Norfolk Peer new potatoes. It's a comfortable 16°C over the land today, down on yesterday's balmy 21°C but a welcome boost to the cold spring we have been having. 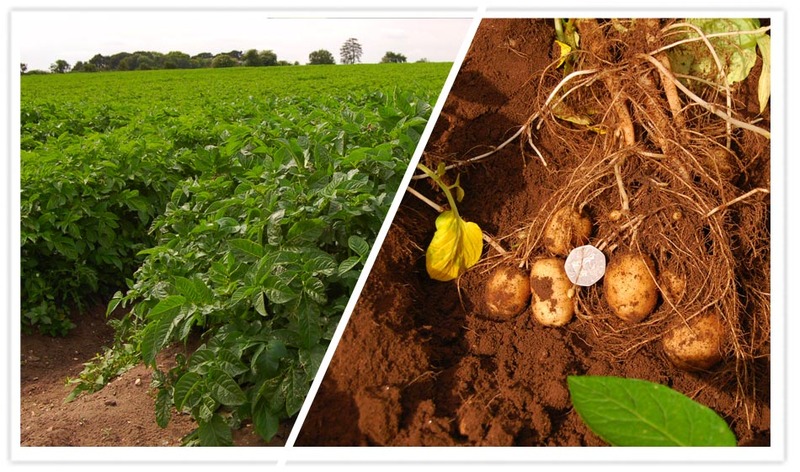 Right now the crop is about 10 days behind last year, due to the colder soil temperatures but the Norfolk Peer potato plants will grow quickly now they are above the ground. March 10, 2015 - 'Locking in' some sunshine. It's a beautiful sunnny day here on the farm in Norfolk and today we carry out the vital task of 'locking in' some sunshine, to keep the seed bed warm and snug. Baby Norfolk Peer are delicate things and need to be protected from the cold to help them arrive into the world. March 7, 2015 - Norfolk Peer planting starts. It feels like spring is arriving. Temperatures are in double figures again and with the land warming up, the first planting of Norfolk Peer new potatoes starts. This field will be fleeced to keep any last minute winter off the seed bed and planting will continue until July, to keep a steady crop of fresh potatoes ready for harvest over the summer. January 2015 - Colder and drier. A colder and drier month than a year ago. 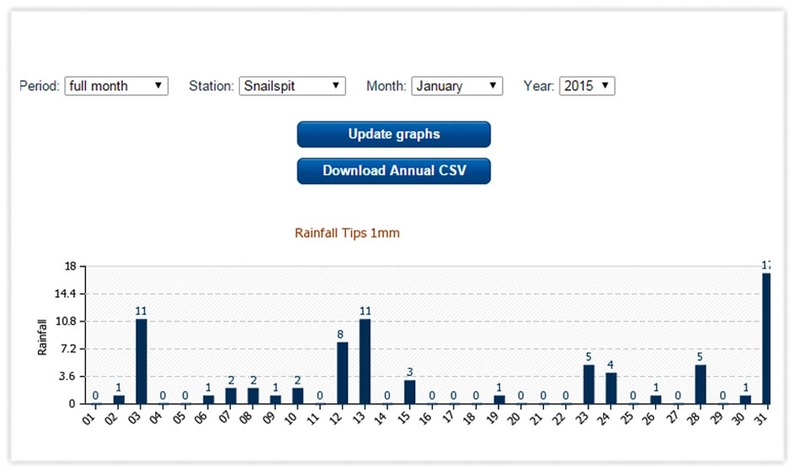 Just 76mm of rain at the farm in January 2015, compared with 119mm a year ago, and cold as well. Average temperature during January was just 3.9°C, with a low of -7.4°C, compared with an average of 5.6°C and a low of -3°C for January 2014. We record the rainfall at several points around the farm to help us determine how much water the crops need. The graph to the left shows rainfall by day for January. The land is already being prepared for planting, with the stone separators out removing the flint from the growing beds. Planting will start in just a few short weeks once the land warms up.